Just off the coast of Mexico, and only a 20-minute ferry ride from Cancun, is the serene Island of Women — otherwise known as Isla Mujeres. 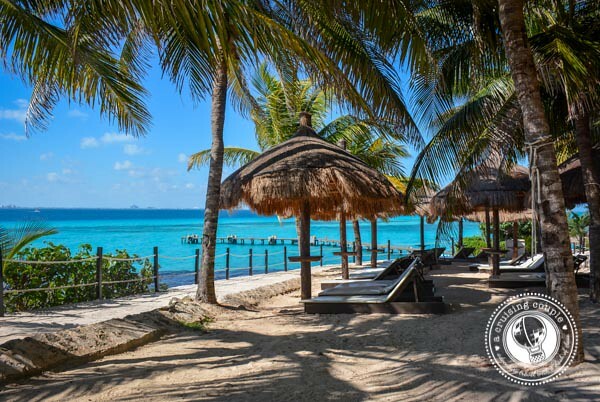 Isla Mujeres is a tranquil alternative to bustling Cancun. There’s not much to do on the island, but that’s one of the main attractions for travelers seeking a bit of idyllic relaxation. Its powder white beaches and mind-boggling turquoise waters are gaining popularity as more and more tourists are making the quick boat ride from Cancun to enjoy the island for a day. 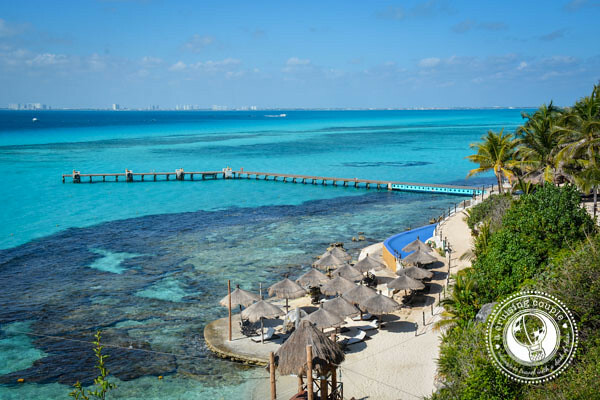 Because we still wanted to take advantage of the numerous activities and cultural attractions around Cancun, we also opted to visit Isla Mujeres for only a day. Our excursion was an organized tour to Garrafon Natural Reef Park with Dolphin Discovery. The reef park is located on the southern tip of the island, and features first-rate views of the sparkling sea—as well as plenty of comfortable places to enjoy it from. On the property there are a handful of restaurants and bars, pools, hammocks, lounge chairs, changing rooms and lockers. 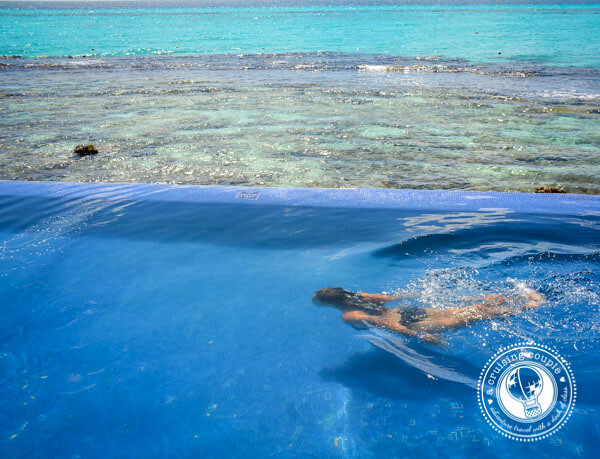 Guests can go on an organized bike tour, snorkel along the reef, sea kayak, and zip line over the Caribbean (for an additional fee). 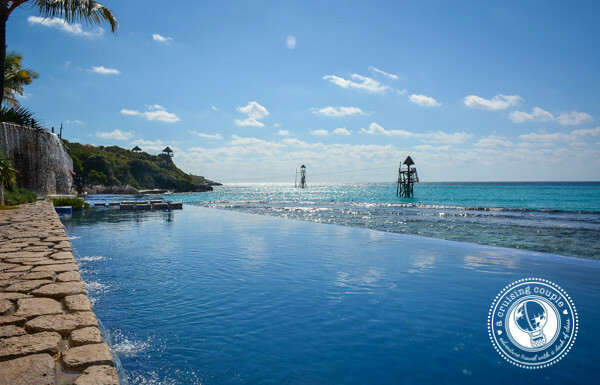 A $79 admission gets you transport to and from the island from Cancun, breakfast and lunch, an open bar, and access to all the activities. The full day tour lasts until 6:00pm, though there is an option to leave around 2:00pm. Just a few minutes away from Garrafon Natural Reef Park is Punta Sur. If you can make it here for sunrise, you will be the first person in Mexico to greet the dawn, as it breaks here first. 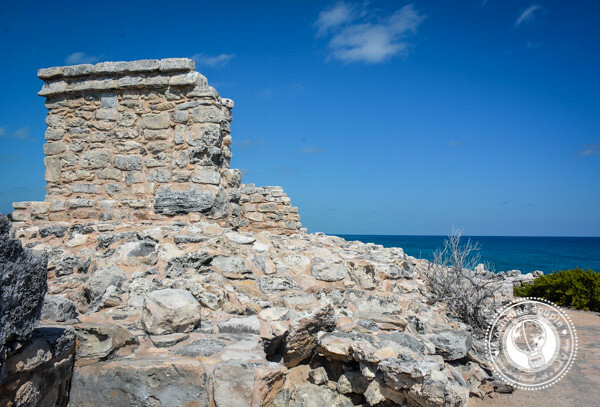 Along with the astounding coral cliffs that jut out into the sea, there is an art sculpture park and rugged remains of a small Mayan temple. It doesn’t take long to walk around the southernmost tip, but the panoramic views certainly make the effort worthwhile. Visitors to the Garrafon Natural Reef Park get in free; there is a stunning access path along the ocean’s edge, worth walking on its own. We were a bit torn about our experience at the Garrafon Natural Reef Park. 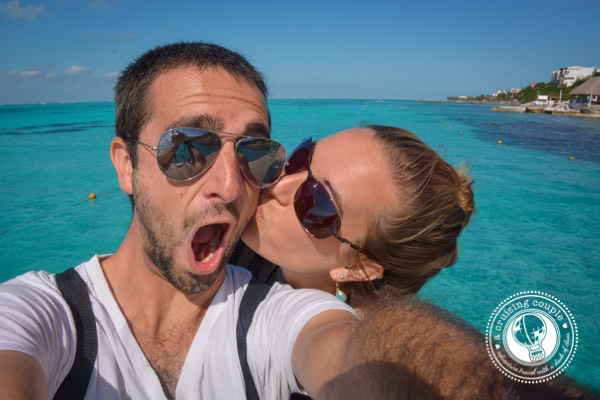 As you can tell by the photos, we adored Isla Mujeres. We lost count of the number of times throughout the day we said, “How can water be that blue? !” The food was good—not great, but good—and though the drinks weren’t strong, they were all-inclusive. Some of the staff members were better than others, but most seemed like they didn’t want to be there. The snorkeling was pleasurable but not life changing. The kayaking was a bit of a joke due to the small roped off space. We left halfway through the day, but we were nearly the only people who did opt to leave early. 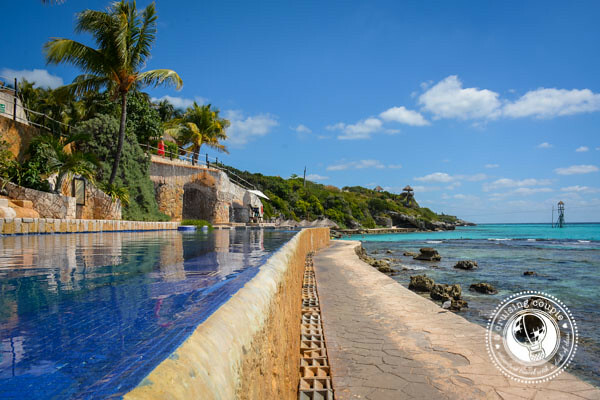 Overall, we would say don’t go to Garrafon Natural Reef Park for the snorkeling. Don’t go for the beach (there isn’t one). Don’t go for the mediocre food and drinks. DO go if you are staying in Cancun and want an all-inclusive day at Isla Mujeres, packed with a variety of activities to participate in. Do go if you’re traveling with a family and want a place where the kids have things to do while the adults have a place to relax with a cocktail in hand. 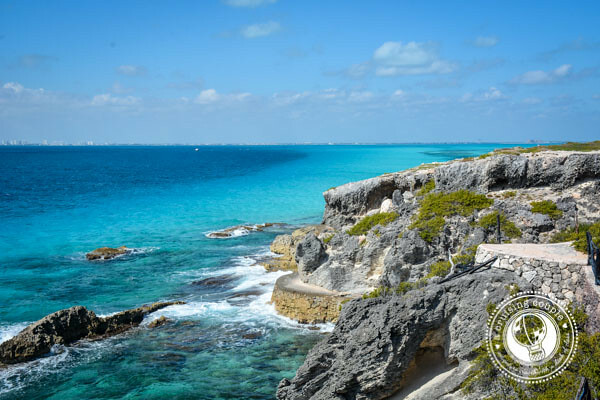 Whether or not you decide to visit Garrafon Natural Reef Park, find the time to visit Isla Mujeres. There are regular public ferries from Cancun. Upon arrival, you can rent a bicycle or golf cart to drive around the island and find the beach of your choice. It might not have zip lining or an infinity pool, but it’s a nice off the beaten track alternative. So the takeaway? No matter how you do it, visit the Island of Women. You won’t be disappointed. We were guests of the Cancun Tourism Board. All thoughts and opinions remain our own. 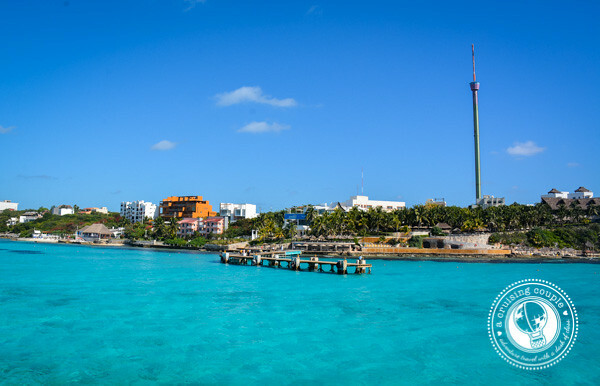 Have you been to Isla Mujeres before? Would you recommend it? What about to Garrafon Natural Reef Park? I like reading honest reviews, often travelers tend to be a bit “soft” when it comes to be critical. This island looks amazing indeed though and the perfect place to go for a relaxing day, thanks for sharing guys! Thanks Franca! We always try to be honest, even if it’s a sponsored trip :) It means a lot that our readers appreciate it! My wife and I spent a week in Cancun and loved it. Unfortunately many of the water activities were out because my wife is confined to a wheelchair. One of the counselors suggested a day trip to the island of women. It was great. I got my wife into the water at a calm beach, rented a golf cart and visited Mayan ruins and toured the beautiful island. I even bought a conch shell that blows like a foghorn. I thought the food was pretty good considering where we were. I’d recommend the Island to anybody. And they sell Cubans on the beach! Palace was just ok, more secluded area in middle of island, but close to the turtle farm which was nice to visit, tons of baby turtles raised and then set free. The house rental was the best yet, saw the sunrise with very few visitors every morning, locals sell tacos in the street nearby & homemade bread, amazing. Best ceviche we’ve ever tasted. You can rent a golf cart and go exploring , shell collecting, hiking , jump in the water anywhere you want along the way. There’s a naval base on the island as well which is neat to drive by everyday. There is s big grocery store for shopping if you rent a house. The island and water are breathtaking and we will go back again soon. I could go on, but….., just go visit. You’re right that Isla Mujeres looks beautiful, but I don’t think seeing it through the lens of an all-inclusive resort would really be my speed. I think I’d get quite bored, to be honest, and feel like I was trapped at a summer camp of some kind! Haha it’s funny you mentioned summer camp- I actually said the same thing to Dan while we were there. I definitely get the all-inclusive market for some people, but it’s definitely not for everyone. We were easily able to leave and explore more of the island (which we did on foot) but if you’re paying that much for the package, it doesn’t really make sense to leave the park. Had the snorkeling and kayaking been a bit better I think we would have recommended it more. What an incredibly beautiful looking place to relax! SOrry to be the wrench in the wheel, but I found Isla Murjes to be very touristy. It probably was a healthier place 25 years ago. Yes, it is better than going to Cancun but not a place I would recommend visiting..at all. 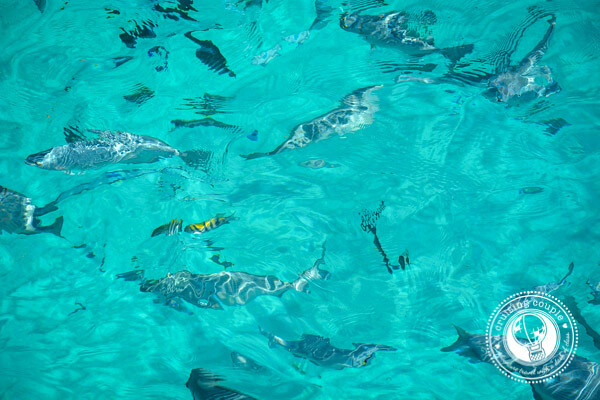 Yes, the waters are fine but what really disgusted me as I was snorkeling around the island was finding a poor shark in a outside tank held..captive for tourists to taunt and jeer at it. I do not know about you, but sharks, wildlife for that matter should be left alone. They should be respected not kept in cages. Why don’t we put a few Isla Mujeres natives in a cage and throw rocks at them? Who would be laughing then? We definitely did not see any sharks in cages, and if we had we would not have approved either. I don’t think that’s normal though, and while I’m sorry to hear about that, the island on a whole is absolutely beautiful. It does see a steady flow of tourists visiting for the day from Cancun, but it is still a lovely escape. I hope you get the chance to return one day and give it another shot, this time without the caged shark to ruin it. I literally knew nothing about Isla Mujeres before reading this except that you can dive with hundreds of whalesharks there. Very interesting to see some other options (and to actually see the island – I’ve only seen pics of the whalesharks hehe)! Yes! I wish we would have been there over the summer to experience it. You can also snorkel with hundreds of whale sharks off Isla Holbox, which we still have to write about :) Of course we missed those too, but we’re definitely making it back there one summer to experience it. It looks unreal! Oh, I’d LOVE to get in that water right about now! Love these photos, and I would also love to see that sunrise. Love love love. Back when I lived in Mexico, all the talk when people went to Cancun was of Isla Mujeres. I’m glad to see your take on it and that you thought it was worth it! OMG! Stunning post.All the beautiful places you add here.This post is one of the best one i think.Loved this post and blog! This brings back beautiful memories to me! We were in Isla Mujeres 2 years ago and loved it there. Zara @ Backpack ME recently posted…For the love of ROAD TRIPS! I absolutely loved this island. We spent the day driving around it on a golf cart which was perfect. The water took my breath away! Great post. Getting ready to head to Playa Del Carmen this week and will check out the Island. Thanks for the review. Also heard that this is whale shark season and that this is the place that they hang out. We will see! I went to Isla Mujeres a few years ago and can concour that the water IS actually that blue! We stayed on the island a few days and loved it. Good snorkeling/diving too- saw a turtle and the submerged satutes of Museo Subacuático de Arte. Roshan recently posted…What Thermomix taught me.